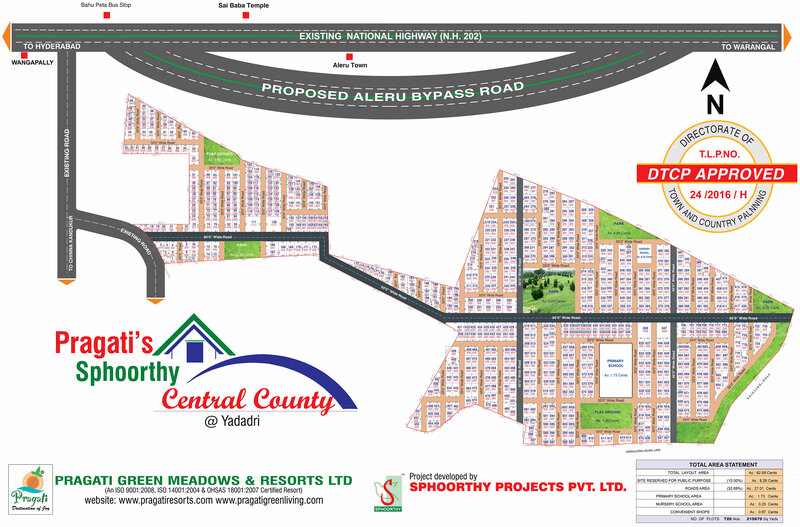 Pragati Group proudly presents DTCP approved 100 acres Mega Residential venture. Pragati's Sphoorthy Central County beside the promising six track Hyderabad - Warangal National Highway (NH 202) in Chinna Kandukur village, Yadagirigutta mandal, Nalgonda District. The project close to Yadadri temple and the world famous Kolanpaka Jain temple is a part of Telangana state governments' ambitious Yadadri Temple and Industrial Corridor Phase I development programme. The project is all set to create a landmark in the real estate industry. • ITIR Zone, Tourism etc.